Ahahaha~ Did ya C haru-chan's face~? Wow such a nice and funny scan. Thanks for sharing. KYAAAAAA! The new calander! I'm so HAPPY!@! And what a CUTE image! everyone's making Tezuka's and Karupin's snowmans! Thank u SO MUCH for sharing! new calendar! >_< so happy! 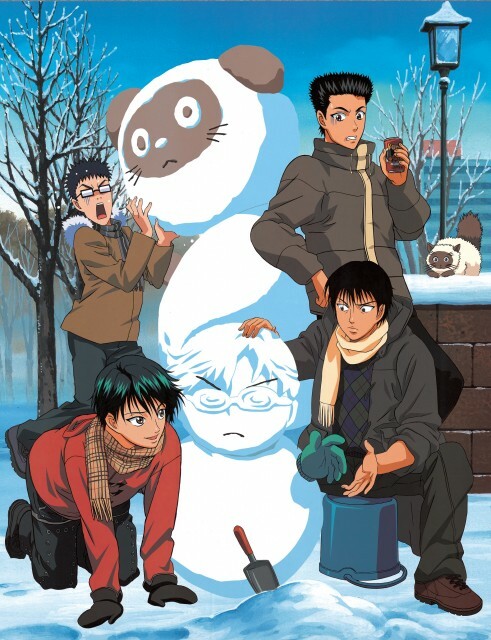 inui looks really funny n tezuka a snow man? wat abt other months?march till june? A great scan - you gotta love Tezuka snowman! Thank you! Kaoru looks so adorable and confused! LOL. Kaoru and Ryoma making a Tezuka snowman! HOW ADORABLE. Tezuka and Karupin has turned to snowman! Inui face looks funny. Heh, Inui's facial expression is priceless. Karupin snowman is funny. :) Tezuka buchou snowman = OMG What the heck? But he still looks adorable!